I wasn’t quite sure what to expect of The Lives They Left Behind by Darby Penny and Peter Stastny (published by Bellevue Literary Press). In a way, the subheading gave it away: Suitcases From a State Hospital Attic. But what could possibly be so interesting about suitcases? Could anything of any significance really have been left inside them? Well, the answer is a very definite yes. The hospital in question is the Willard State Hospital in New York – originally called the Willard Asylum for the Insane – which opened in 1869 and finally closed in 1995. Soon after its closure, a very large number of patients’ suitcases were discovered in the attic of the Sheltered Workshop Building by the curator of the New York State Museum. He had been exploring the site in search of artefacts worthy of preservation. The various crates, trunks, and suitcases that were found there were not empty. They contained all the remaining possessions of the patients they had belonged to: clothing, photographs, books, papers, mementos, and much more besides. The luggage was saved, and a group of archivists and curators began a ten-year plan to sift through the materials. What The Lives They Left Behind does is reconstruct – as far as is possible – the biographies of a few selected patients (mainly from the earlier part of the twentieth century), drawing on the content of their suitcases supplemented by any medical records or other documents that may have survived. What emerges makes grim reading, as these few unfortunate incarcerated patients of Willard are (at last) acknowledged as real people with real histories. It is notable that almost all of the patients portrayed in this book are immigrants to the United States. Whether these few patients are truly representative of Willard patients in general is unclear, but if they are, there is a definite suggestion that factors such as nationality, social class and ethnicity played a role in deciding who was to be admitted to the institution. A little more clarity about this would have been helpful. It is certainly apparent that the psychiatrists who diagnosed these patients did so according to their own social and cultural assumptions. Where there was evidence of psychotic delusion, the doctors made no effort to appreciate elements in the patient’s background – such as unfamiliar religious practices – that may have given rise to the delusions. Symptoms were observed and described, but no effort was made to understand them. But, as the book makes clear, until the 1960s, there was never any real thought given to ‘curing’ or rehabilitating patients; they were simply kept out of the way at Willard – often for many decades – and frequently put to work to maintain the hospital’s partially self-sustaining economy. It is especially telling that following the death of a patient whose job was to tend the hospital’s cemetery, that that particular patient was given an anonymous grave and the cemetery he had cared for so meticulously was left to become overgrown. Although the lives represented in this book are well reconstructed, I get the impression that the priority given to documentary facts and their interpretation sometimes gets in the way of letting these lost voices really speak. But, on the whole, the authors achieve a good deal in bringing these hidden lives to public attention, and also drawing lessons from past psychiatric practices in a critique of the present state of mental health services. The Lives They Left Behind has a lot to recommend it, though it may be a little ‘dry’ for some readers. However, it resists the temptation to be overly academic, and therefore paints a picture of Willard State Hospital that will be readily accessible to most people. On Thursday, 13 January 2011, I was interviewed live (over the ’phone) by Emma Britton of BBC Somerset. The interview went out shortly after 11 am, and it concerned my book, Delivered Unto Lions, and the experiences that inspired it: those of having been a child psychiatric patient in the former Merrifield Children’s Unit at Tone Vale Hospital, near Taunton, in the 1970s. For copyright reasons, I cannot offer a full transcript of the interview, but I reproduce here a transcript of my own words as broadcast. Emma Britton began by asking me how I became a patient at Merrifield. Emma then asked what I had thought at the time about being admitted to the unit. I was then asked to describe what it was like. Then Emma asked why a child of 12 would have been suffering with depression in the first place. Emma enquired about my medical treatment. The depiction of mental hospitals in films like One Flew Over the Cuckoo’s Nest was raised, and I was asked if Merrifield was anything like that. Emma then asked why I wanted to revisit my experiences in writing Delivered Unto Lions. Was it difficult? she asked. The question then came up of my book being described as a novel. Emma then asked if I was pleased to hear that Merrifield and Tone Vale had been closed and a new village built in their place. She also asked how I felt about the shift in the approach towards people with mental health problems. ‘On the whole, I’m quite pleased about that. I know there’s been a lot of criticism of Care in the Community, and there’s been a number of high-profile cases where it hasn’t worked, with tragic results. But on the whole, I think it’s been a very positive move, especially for children. And, of course, I was very pleased to hear that the hospital and the children’s unit had been closed down. But I do have some reservations as well, because now, at Cotford St Luke [the new village built on the site], there’s no real sign that Merrifield Unit existed at all – you wouldn’t know it had ever been there. Although that’s good in one sense – that something new and positive has been built on the site – on the other hand, it’s a bit like having your memories buried. I very much think we should learn from history to make sure these things don’t happen again, so it’s almost as if the evidence has been removed. But, generally, I think it’s a very positive thing. In a way, that piece of land, as it were, has been kind of 'redeemed' or 'saved' by having housing built on it. That’s great, really. The issue of catharsis was then broached: had writing the book laid any demons to rest? ‘To a certain extent, but rather than the actual act of writing the book – which, as I said, was extremely difficult – what I have found very helpful for me is some of the reaction I’ve had to it. I’ve heard from some other former patients of Merrifield, and other people who are interested, and just hearing that reaction, hearing that perhaps in a small way I may have helped one or two people, that has really helped me. That’s made quite a big difference to me, and it’s put the whole experience into a new perspective. Finally, Emma asked about my current state of health. With the rise of Care in the Community in the 1980s and ’90s, the old Victorian asylums were finally closed. What is less well known is that this period also saw the closure of children’s psychiatric units – places like Merrifield in Somerset and Gwynfa in North Wales (both were closed in the mid-’90s). The reason why the closure of these units is less well known than that of the adult mental hospitals is that very few people were aware these places existed in the first place. Before Care in the Community reached its height, most people in any given area would know the name of their region’s ‘madhouse’, but hardly anyone would be aware of the equivalent provision for children. Although my book, Delivered Unto Lions, is set in a fictional children’s unit in Mid Sussex, I make no secret of the fact that it is inspired by the Merrifield Children’s Unit which used to stand in the grounds of the former Tone Vale Hospital in Somerset. Merrifield is gone now, completely demolished, as is most of the Tone Vale complex – only a few (Grade II Listed) buildings remain. Tone Vale is not unique in this respect. This is what has happened to many of the old asylums in Britain – parts have been demolished (or allowed to fall down) while features considered to be of architectural merit have been preserved. In some cases, new housing has been built on the sites of old mental hospitals, and some former hospital buildings have been converted into flats. This is what has been happening with High Royds Asylum in West Yorkshire and the Cumberland and Westmorland Counties Asylum near Carlisle, to name just two. This is also what has happened with Tone Vale. A whole new village – called Cotford St Luke – has been built on the site. But while the few remaining parts of the old hospital have been incorporated into the village, there is nothing left of the children’s unit whatsoever – you would never know it had been there. On the whole, I think this is very positive. To my mind it is quite right that a place where children were subjected to unpleasant institutional ‘care’ should have been ‘rescued’ from its dark history and put to new and better use. There is a sense in which Merrifield has been ‘redeemed’. Merrifield was an institution where children with a wide variety of mental health disorders (and sometimes with no real disorders at all! ), were placed in isolation from normal society. It was common practice to drug these children excessively, and often inappropriately, with no thought to what these substances might do to the developing brain. Some children were also occasionally subjected to abuse, and many were treated in a generally punitive way, as though being depressed or anorexic, for instance, was some sort of moral offence. But the site where these things happened is now a housing estate, providing homes for individuals and families. It has been saved from its past. Of course, not all of Merrifield’s former patients can say that they too have been saved from their past. While some have made substantial recoveries from their original conditions and also overcome the trauma of their time in residential psychiatric care, others have had their lives permanently blighted by the way they were once treated – even if that treatment was well-intentioned. As a former Merrifield patient myself, I can say that I am very lucky, having been able to live a relatively full and satisfying life since leaving that place – though I am still very much haunted by my memories. This introduces another aspect to the demolition of Merrifield – and places like Merrifield. While it is good that the unit is gone, having been replaced by something of greater community benefit, I have one particular concern connected with its destruction. There is now no concrete reminder at that place of what once happened there. While there are many adults still troubled by their experiences at Merrifield, there is a sense in which the evidence for these past traumas has been swept under the carpet. While few people would have known of Merrifield’s existence when it was open, now there is no sign that the place ever existed at all. And so I conclude with a challenging paradox. It is good to build over a place of past distress with something new and positive. But it is also bad to bury the past as though it never happened. In rescuing places and people from troubled histories, we should still remember those histories and learn from them. How else can we make sure that history is not repeated? 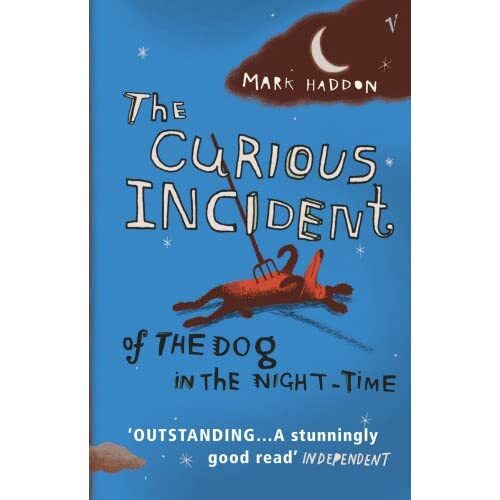 For my second attempt at a book review I have decided to take a look at The Curious Incident of the Dog in the Night-Time by Mark Haddon (published by Vintage). Curious Incident is a work of fiction written in the first-person from the perspective of a 15-year old boy with Asperger’s Syndrome (an Autism Spectrum Disorder). The book is, supposedly, a murder mystery in which teenager Christopher Boone sets about investigating the death of a neighbour’s dog. But the ‘murder mystery’ isn’t really the subject of the book, but rather a means for getting into the real story. This is the story of a boy who, due to his condition, has difficulty relating to the ‘normal’ social world. Much of the plot centres on the way he naively attempts to satisfy his enquiring mind while steering his way through family tensions and the well-meant advice of staff at his special school. The novel has been generally well-received – indeed, it is an international bestseller – but some commentators with first-hand experience of Asperger’s Syndrome have questioned its accuracy in portraying the condition. For readers who would prefer a more authentic account of AS, I would suggest they read Freaks, Geeks and Asperger Syndrome by Luke Jackson. Nonetheless, the confidence of Mark Haddon’s writing means that the central character of Christopher comes over as convincing (allowing for the absence of a more nuanced view of AS) and the story is plotted in a very engaging way. The major strength of Curious Incident, in my view, lies not in the accuracy (or inaccuracy) of its portrayal of Asperger’s, but in its observation of the ‘normal’ social world of human relationships and interactions. In this sense it stands alongside modern fable, such as Richard Adams’ Watership Down, and some of the more literary examples of science fiction, in placing the reader at a distance from the ‘real’ subject matter. From this distance, the reader is able to see essential themes from a new angle while also being entertained. Another strength rests in what the book says about the responses of ‘normal’ people to someone with a mental health or neurological condition. These responses range from the impatient refusal to answer questions and well-intentioned deception, all the way through to blatant mockery and hostility. I must, however, raise another word of caution. Curious Incident is written in a style somewhat reminiscent of Jacqueline Wilson’s Tracy Beaker books. Wilson’s books are, of course, aimed at children, but while Curious Incident is indeed available in a children’s edition (with a different cover design; the text remains unchanged), it is not suitable for pre-teens due to some of its content (including a very high number of expletives). Allowing for the two qualifications I have mentioned (its inexact portrayal of Asperger’s and its unsuitability for children), I have no hesitation in recommending this book.